Ghana Sevens rugby is set to take part in this year’s Africa Cup Sevens to be held in Uganda on Saturday October 6. Peacefmonline.com reports that Ghana Rugby Football Union(GRFU) confirmed that the Union was drawn to take part in the Rugby Afrique’s Men’s sevens two-day tourney. This is because it qualified as a full member of World Rugby on 10 May 2017 just under three years under the administration of Herbert Mensah as President. Rugby Afrique could not organize a qualifier playoff between the other possible three teams - Mauritius, Cote d’Ivoire and Ghana so the executive committee drew in a transparent and unbiased fashion between the three countries. Ghana came out first, then Mauritius and lastly Cote d’Ivoire. Nine other teams automatically qualified for the tournament, namely Kenya, Uganda, Namibia, Madagascar, Zimbabwe, Tunisia, Morocco, Senegal and Botswana. Africa Cup Sevens will serve as Sevens World Cup qualifier where finalists will qualify for the global showpiece in San Francisco, USA. Kenya has already qualified for the World Cup by the virtue of reaching last eight in 2013. 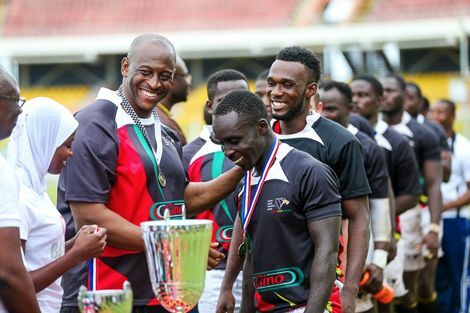 According to Herbert Mensah, the President of Ghana Rugby, this is a once in a lifetime opportunity presented to Ghana Rugby. “I have little doubt that Ghana Rugby is by far the underdog of the ten teams and may have a very slim chance to make the cut in 2017. The fact that we got this chance was not just luck. It took enormous effort and huge amounts of money to get in the position to even be considered,” Mensah told Peacefmonline.com. Uganda are the Africa Sevens defending champions as a result of their 38-19 win over Namibia in 2016.